Donic's Baracuda is somewhat unique. While not lacking in speed, the primary focus of this rubber is extremely high spin and the highest throw angle of all rubbers that are currently available. This high throw angle and spin allows for a greater ability to attack backspin and a greater margin to clear the net on counter loops. This rubber is made for players with a spin first game style and use it as their primary attacking weapon. Yes, it's really good rubber! High ark strange for the starting, but then you understand - the ball touch the edge of the table in most of cases, just a little regulate angle of the attack. Good control and speed. Spin under the process. Ok for the backhand. Хорошая накладка, высокая дуга, и чуть регулируя угол ракетки понимаешь, что в край стола всё равно попадёт. Контроль, скорость. Кручения осваиваю. Ок слева. Ótima borracha para quem procura um material de bastante spin, bom controle para jogo próximo da mesa. Alto poder de rotação! I haven't used it long, but for the price, this combined with Tibhar Stratus Power Wood+Yasaka Razka 7 feels to be faster (and less forgiving) than my Yasaka Extra Offensive 7 Power with DHS Neo Hurricane III+Xiom Vega Europe. Наверное лучшая накладка налево, актуальна до сих и под новый мяс D40+. Отличная накладка. Имеет хорошие врашение. Fast shipping. Cover is good, but quickly showered. After one month,on BH to Stiga Infinity VPS V. Great rubber. I find that I've had difficulty playing the faster tensors. I've had no difficulty playing with the Baracuda. It is very linear, as in what you put in, you get out. The spin created is rather unexpected and totally welcome, with a smile. Great rubber, no wonder even though it has been around for a while, it keeps selling. Very good rubber, excellent spin, enough speed and ideal for my playing style. I play with Baracuda for four years. I won't change them. It is the first time I buy rubbers and I can't say is it better or not than other rubbers. But I like it very much. It suits me well. Thank you very much. Очень сбалансированная накладка на любую сторону. Ļoti kvalitatīva gumija, augsts izmetiena leņķis, stabila, reakcija vienmēr vienāda. Nav ļoti ātra, "strādā" ilgi, pēc sajūtas, vidēji cieta. It feels good and spinny but can't compete with modern rubbers. I bought this rubber as a potential BH replacement for Adidas P7. It is a traditional rubber with similar characteristics, but the throw angle is too high for my purposes. Can I tell a difference between this a T05? Barely - Barracuda has a softer sponge so I feel like I need to execute a slightly more active shot. T05fx feels identical to this for me. This rubber does have some bounce to it, it is also has loads of spin. It works great looping and has some power for passive shots. It is rather sensitive to spin on passive shots. It's what you get for having so much spin, I suppose. Durability wise...I'm the most lazy person on earth with my rubber. I do not clean them except as needed and put nothing on my rubber after usage. I just throw them in my bag. I also live in a very dry area. After about 4-6 months of 4-8 hours of play a week the rubber loses it's spin. A good sign the rubber is done is that the edges will begin to flake off. I've not seen another rubber do anything quite like it. I think this is a great offensive rubber for intermediate players who have basic looping technique - it isn't too fast. I am personally evaluating rubbers with a bit harder sponge as my game has continued to develop. One last thing to note about this rubber is that it is one of the top sold rubbers out there and you should be able to purchase fresh sheets from major retailers like tt11. I've tried this rubber for fh and bh but it's a bit annoying on fh if you're used to Chinese rubber or tenergy 05. The throw angle is quite high on a flexible blade, it's only good if you don't do full on brush strokes because if you do its going off the edge of the table. Tenergy05 doesn't have this problem even though it supposedly has a high throw angle also. Baracuda on a carbon blade is alright for forehand however, as topspin shots come down on table earlier. For backhand this rubber is not that sensitive to spin but is good at producing spin, has pretty good speed, and is fairly effortless for doing backspin shots because of the high throw on flexible blade, so you aren't likely to have any shots going into the net. So my current setup is fh Hurricane 8, bh Baracuda 2.0, on a flexible wooden w-6 blade. I dig it. Last long, easy to control and a lot of spin. Отличная накладка. Контроль и вращение на высоте. Приличная скорость при прожиме. Что хорошо -без всяких выбросов. 17/05/2017 Nice speed Review by Ronald S.
Excellent rubber. I have been playing with this rubber for more than 6 months now. Great spin, great control. Накладка просто класс. Очень удачное соотношение жёсткость-мягкость. Отличный контроль. И единственный маленький недостаток -вес. брал в 2.0 на бх,брал на замену более мягкой ксиом вега европа,вращает лучше,губка тверже. На фх стоит ксиом вега про.мне такое почетание нравится,я пока остановился на нем. основание лучшу брать с карбоном для них.у меня ела эмошион. Spin and control not as good.. Sponge is too hard. No dwell time. This rubber isn't too heavy and has a lot of spin. I use this rubber on my FH side and looping instantly became easier. I feel like you need really good form while using this rubber. This rubber is really good for close to the table blocking but needs more effort put into hit when away from the table. Thanks to tt11 for the fast shipping and excellent service. One of the best rubbers I have played, and I will tried it on different blades. Excellent speed/spin/control balance. I play red 2.0 on the fh. очень достойная накладка для игры с бекхенд. Acuda is probably better, rubber is soft for loop not smashing as i thought. I play a few times and traded for Tiabar evolution FX which is harder rubber and smash and loop well. I've tried a lot of rubbers of the past couple years and this is probably the best all around, spinny, stable rubber that i've tried. It has plenty of gears, lasts a long time and it's very well priced. Like everything i've received from tabletennis11 it's shipped fast and well packaged. Great product - great table tennis equipment company!! The rubber is a bit slow so I put it on BH side. The spin is good. Good weight , response and control. for now I find it the best for bh from all rubbers I tried. Perfect grip, very good control and enough power. 15/05/2015 Excellent wood blade! Review by Shawn C.
Power: when playing normal rally, the power seems about 8.7 out of 10, but when you smash hard(8), it lacked the carbon backbone & speed of the fast blades that I have. I would say the overall speed is 8.5. Not very fast but not slow either. However, it makes up with more spin in loops and higher throw and that was the main reason that I bought this blade. Blocking is very good when using harder rubber. I have Galaxy Moon Max (FH) + Vega Pro 2.0mm (BH) both sides are harder rubbers. TSPW blocks like a wall, very solid and good feel. I really like the solid feel comparing to my other carbon blades which feel somewhat numb vibration free. Next time I would like to try medium hard rubber for the backhand. Overall, it's a very good blade at exceptional good price. Very grippy, good for opening on underspin. Bad performance at topspin and countertopspin when only hitting with topsheet and without sponge. When hitting with sponge the arc is good (very spinny). But brushing is only good on opening loops. If u want to brushloop blocks or opponent topspins, the rubber behaves disastreous. Balls just dropping into net. Good control and spin at pushing. Rubber really shines when the Ball digs into the sponge. When you try to brush loop it is not good. Since I started playing with this rubber, it keeps me amazed by its grip. Spin is at very high level. 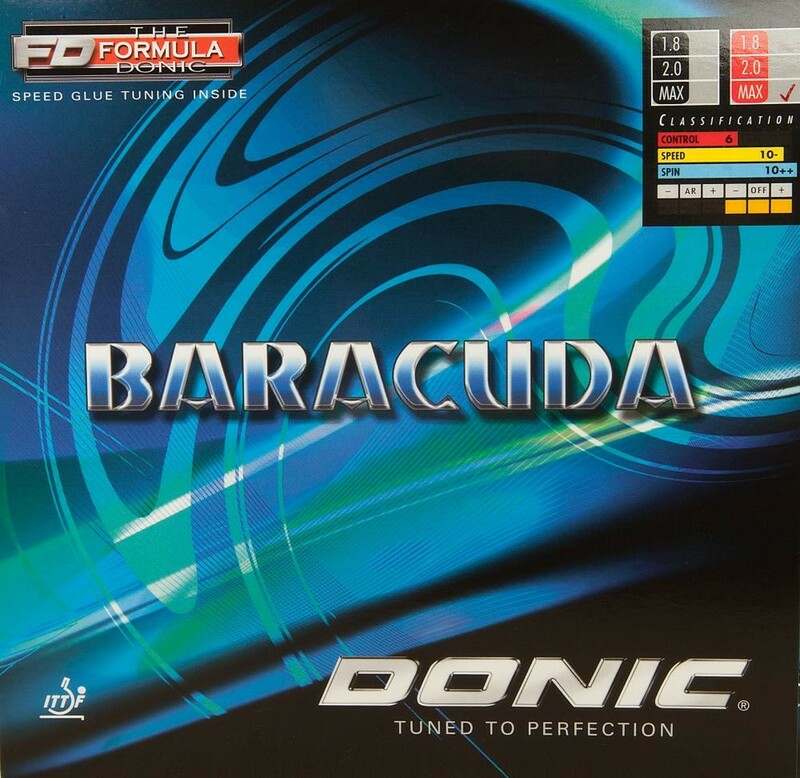 I am pretty sure that so many people love playing with Donic Baracuda, so I dont even have to say anything about it. Very modern tensor rubber, high throw angle, good and soft feel, good control, good quality and durability. I will keep on always using this rubber. I have it on both BH and FH side (2mm on Yasaka Extra). Good rubber for European style attacking players. The rubber is good. I recommend off or off+ blade. Very good, fast shipping to Belarus, the best tt shop! Это одна из моих любимых накладок, очень изнозоустойчивая. Достатчно контроля и вращения. накладка не быстрая. Spin and good control. I bought one 1.8 and one 2.0. Now I use it for FH. I think I will move it to BH when I need another FH rubber with higher speed. Extream spin, suitable for topsplin style. Muito boa, pega bastante efeito. tried this rubber at different times and it seems like the sheets vary from one another, don't know if any one else has experience this. I've had some that played very good, but I got some that was crazy fast and unpredictable. 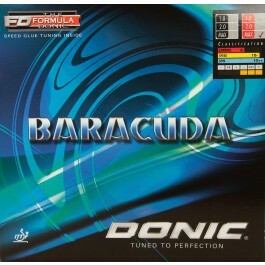 People say DONIC Baracuda is soft, I don't think it's soft at all! It's medium hard!! Medium speed, spiny, high throw. Ok rubber. This is a great rubber in terms of the price. I like the spin but I need a little more on the speed. Very good rubber not so fast but spin is huge,trow angle is high ,hard to beat for the money.